Gear up, bridesmaids! 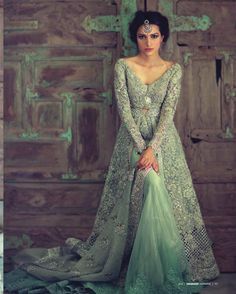 Since you are not attending this wedding merely as a friend, your dress has to be appropriately grand. 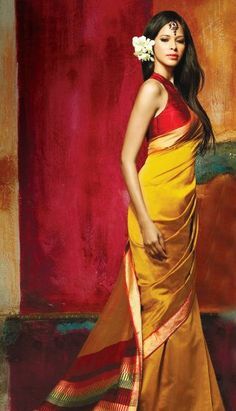 You will be in all or most of the wedding pictures, and you are also expected to help out (which in Indian weddings means run around) so you must be comfortable. Add to this the summer heat, which means your dress has to be airy enough to survive the mandap is the heat. That’s why we have brought you these designer dresses to pick from! Being a bridesmaid, a lehenga is a great option. Not as heavy or glamorous as the bride’s of course, but interesting in its own way. As the bridesmaid, you are not required to stick to the bridal palette or a decent neckline, you are free to experiment. Use this to your advantage and go bold. 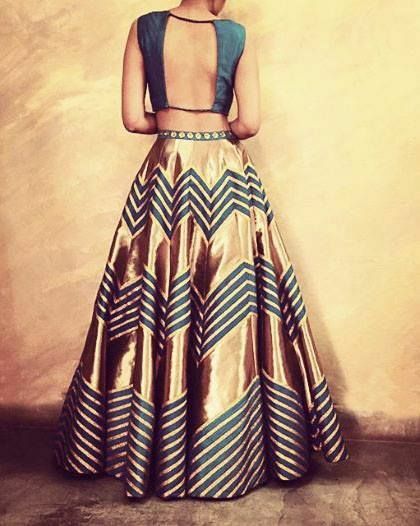 Pick a gold and blue chevron printed lehenga and pair it up with a daring backless choli. Nobody can deny that it will turn heads, but it doesn’t scream for attention either! The latest trend in lehengas is the crop top choli. It’s perfect for a bridesmaid as it is western enough to be considered funky but Indian enough to be considered desi. 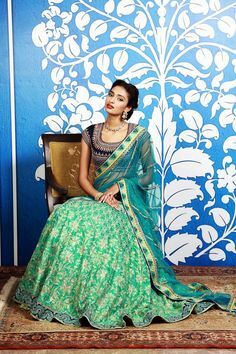 The upside of picking a lehenga with a crop top choli is you can always reuse the crop top by pairing it up with palazzos or a fitted, long pencil skirt. Remember to keep your crop top choli simple and you will be able to work it with almost anything in your wardrobe. As a bridesmaid, anything that comes close to the bridal palette of colors is out of the question. But that means the world of blacks, teals and baby pinks is open to you! Pick a soft color like pink for an early morning wedding. A chiffon dupatta gives it a casual-but-classy appearance which works very well with long curls, left to cascade down your back. Pick a teal or blue for a wedding that is a little more posh or slip into it for the reception. The black lehengas are an ideal fit for a late night North India wedding because they make you look like you belong on the dance floor. A sari is also an acceptable choice for the bridesmaid. But that doesn’t mean you have to be boring about it. Pick the black and white number sported by Nargis Fakhri which looks fit for a Derby and will definitely work for a day time wedding. You could also go a little sultry and shimmery with Sonam Kapoor’s pick of candy floss pink studded with crystals and that jaw dropping strapless blouse. Feel free to experiment with the type of blouse and sari to create the perfect look for yourself. Before you choose your bridesmaid’s dress, be sure to tell the bride. After all, it is her wedding, so she may have a certain color scheme in mind. She may even know of someone else planning to wear the same thing as you, in which case- disaster averted! But most important of all, be sure to pick something comfortable so that you are able to perform your bridesmaid’s duties well.